TNReady scores won't count for more than 450 Anderson County students who were given tests for science and social studies for the wrong grade level. Over 900 TNReady science and social studies tests given to Anderson County students were for the wrong grade level, according to Director of Schools Tim Parrott. "I think it’s really just frustrating because of all the work we put into a school year," Parrott said. "Anytime things like that happen, when a student can’t log on, when a student gets logged off or they can’t submit their test, those frustrations just become enormous." Parrott said a letter was sent home to parents of Norris Middle School students this week informing them of the issue. The letter says the testing issue is no fault of the school system, schools, testing administrators, teachers or students. "I have notified Lt. Governor McNally, Representative Ragan, and Commissioner McQueen to make them aware of this situation and the negative effect that it is having on our whole school community. Our students and teachers work hard every day and the ineffectiveness of this year's testing is unacceptable," Parrott wrote in the letter. For a third consecutive year, problems plagued the statewide standardized test. The problems in Anderson County were the most recent in a string of difficulties. Parrott said he received dozens of phone calls from parents wanting answers, and he is just as frustrated as they are. "They call the director of schools and they want to know what I'm going to do about it," Parrott said. "I have no answers." Many parents have been asking the same thing: Why not switch back to paper and pencil? Anderson County recently invested more than $2.5 million to buy computers for every student. Parrot said it's not realistic to switch back to paper tests. "Online testing is what we need to do, but we need to make sure it's done right," Parrot said. "Once a student sits in front of a computer that won't work, they get frustrated and they don't try." 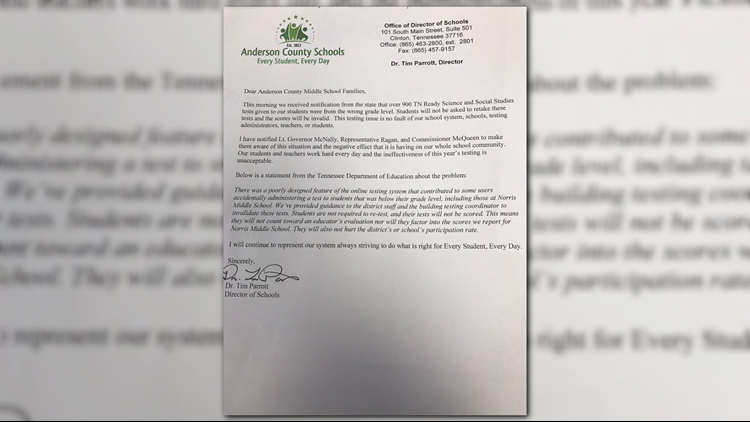 The letter also included a statement from the Tennessee Department of Education about the problem. Scores for those tests will not be counted, according to the statement. Knox County Schools spokesperson Carly Harrington said 21 Knox County students were affected by the same issue, and received tests for the wrong grade level. "The state has come out and acknowledged it was the result of a poorly designed feature of the online testing system. Affected students will have the option to retest if they want," Harrington said.